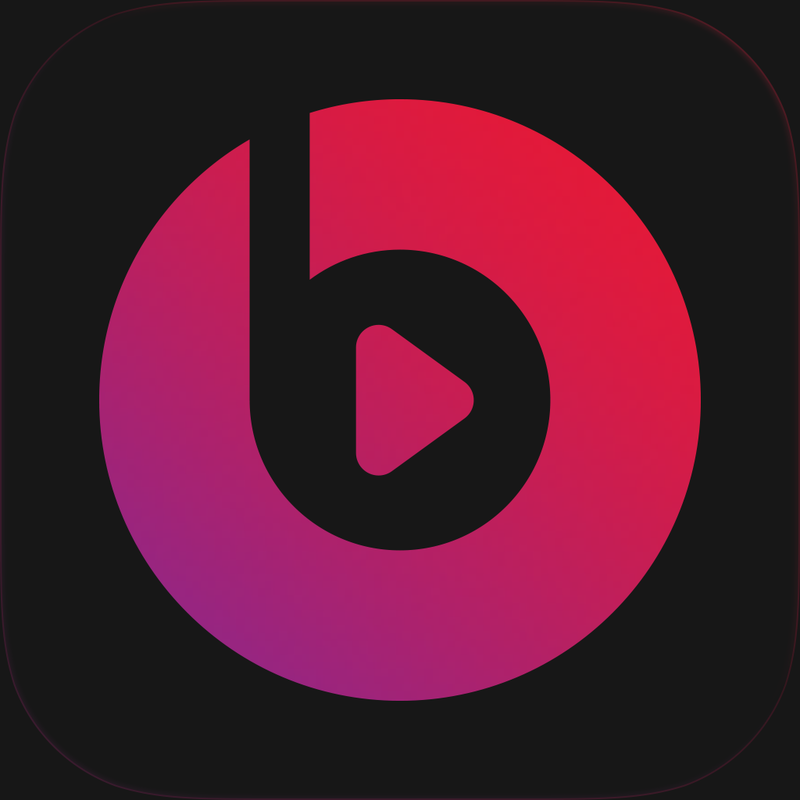 It has been nearly two weeks since Beats Music first launched for the iPhone/iPod touch and other mobile devices. This means a 14-day free trial is about to end for early adopters. As one of those users, I’ve decided to pony up and buy a monthly subscription to the streaming music service. There are a number of reasons why I made this decision. Beats Music has one of the largest music libraries in the business, but this isn’t what makes it unique. In fact, if you’re the type of person that simply wants to listen to the same music each day, by all means stick with your Spotify, Rdio, or other service. Want to move beyond your comfort zone? 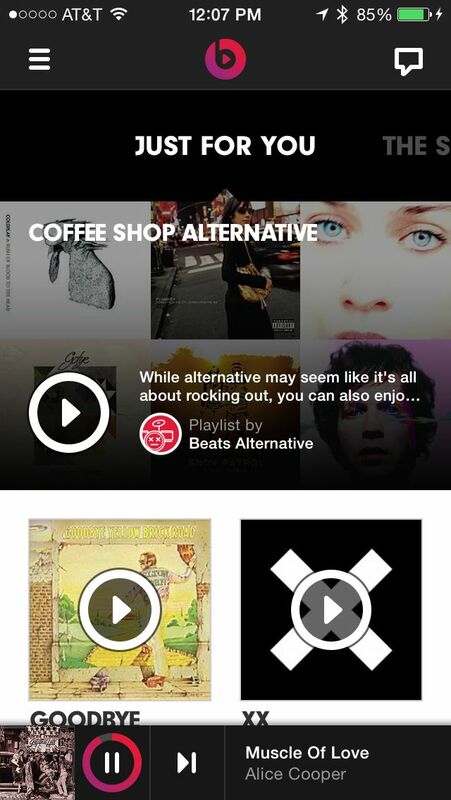 Beats Music is ready to serve like no service before it. “Just for You,” which acts as the service’s home screen, offers personalized recommendations based on your listening history. Here you will find album links, playlists, and more. No other service currently offers this type of customization, or intuitiveness. Best of all, this page is always updating, depending on how often you’re listening to music. Beats Music also receives kudos for its somewhat unique “Highlights” page, where you will find links to music based on current events and album releases. Right now, for example, Beats Music is featuring music from Bruno Mars and the Red Hot Chili Peppers. Both were featured during last night's Super Bowl. When I am driving, I really don’t care what is happening on the Apple Maps screen. I just want the app to successfully get me from point A to B, and for Siri to direct me accordingly. I’ve always taken a similar hands off approach when it came to the interface on my music apps. As long as they worked, and the controls were easy to use, I was a happy camper. The Beats Music app for iPhone has made me realize that having an awesome interface is important. And when done right, actually enhances the overall listening experience. As Christine Chan first mentioned in her review, the Beats Music app interface is very cool. It is also extremely functional. Every prompt, button, or slider has been added to make the listening experience better — right now, and in the future. 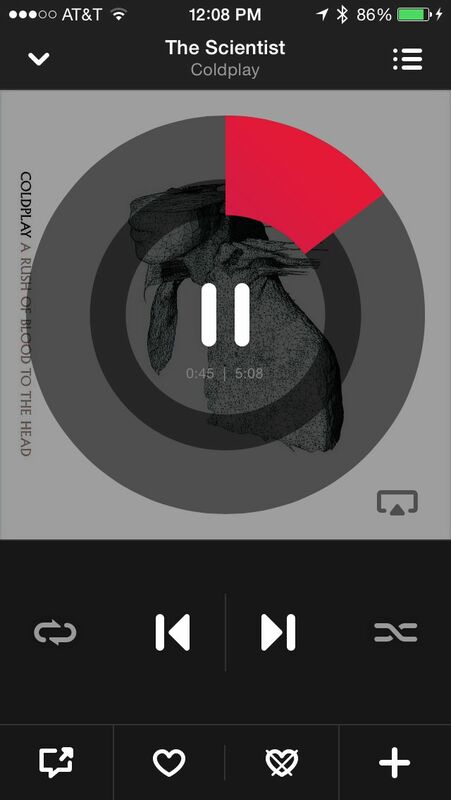 On the Now Playing screen, for example, you’ll find a large play/pause button overlaid on the album artwork. A clock surrounds this button that shows the current song’s elapsed time. Click anywhere around this clock and you can move to a different location on the song. Brilliant, simple, and beautiful. At the bottom of this screen, you’ll find the controls for repeat, shuffle, and skip forward or backward. You’ll also see buttons for sharing, love or hate it, and adding the track to your library, playlist, or offline collection. These types of buttons are found on other apps, of course. However, I found that the ones presented here are easier to use, and therefore more functional. 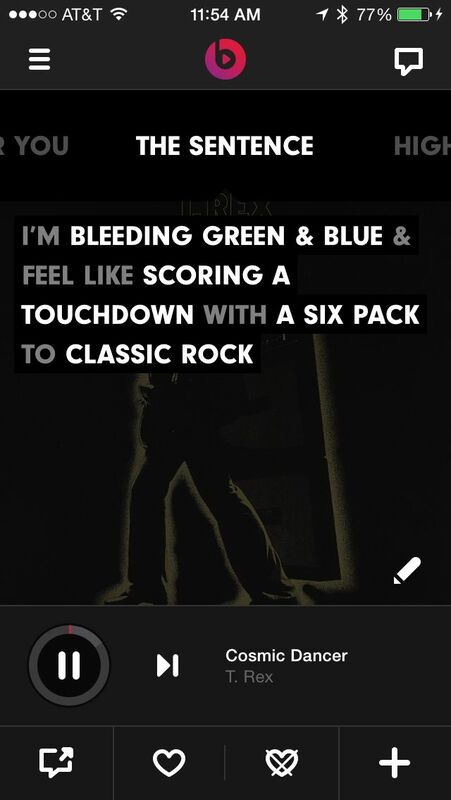 The final reason I’m sticking with Beats Music is because of the service’s highly addictive “The Sentence” feature. Here you’re asked to fill in the blanks to a sentence. By doing so, Beats Music will create a special playlist. What makes this feature truly special is that the choices the service offers to fill in these blanks are constantly changing. For example, The Sentence always starts with a blank that begins "I'm ... " At the time of this writing, the choices here include: “At the Park,” “Out and About,” “At a Party,” “In Bed,” At The Gym,” “In My Pajamas,” and to celebrate the Seattle Seahawks’ Super Bowl win, “Bleeding Green & Blue.” Awesome, no? I'm often asked to name my favorite streaming music app. Right now, it is definitely Beats Music. However, I'm a fickle guy. Next month, another service could bring a new feature online and convince me to switch. Later down the road, I could switch again. Competition is great, no? The bottom line: There are really good streaming music apps out there. With the premium service for each priced at around $9.99 per month, switching is easy and expected. Do it -- and often. 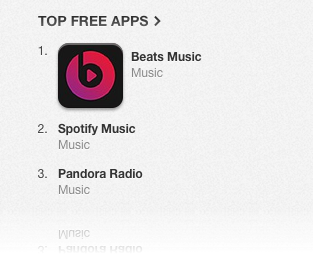 The free Beats Music app is available for download in the App Store. New users will receive a free trial.